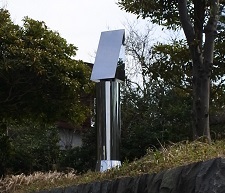 “Development of a Cylinder,” an outdoor sculpture by ODA Jo has installed near the main entrance of the Hayama Museum. It was on view at the Kamakura Annex since 1984, and transferred from the Kamakura Annex which is currently closed for renovation. We hope you to enjoy a new landscape with sculptures in Hayama.